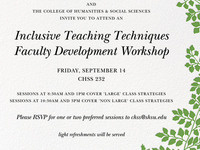 The College of Health Sciences and The College of Humanities and Social Science invite their faculty members to attend an Inclusive Teaching Techniques workshop on September 14, 2018. Dr. Kelly Hogan and Dr. Viji Sathy will host four non-concurrent 90 minute sessions in CHSS 232. Attendees will participate in active learning schemes and case studies exploring inclusive teaching techniques.